Note: Week-long Elkhead Reservoir fishing tournament begins June 23. The runoff has begun and is increasing flows on the rivers and streams throughout the state. The extra flows will surely get the substrate stirred up which will flush some of the larger insects and worms into the flow and the trout will surely be feeding heavily. This means anglers must use a bit larger and flashier presentations when fishing these conditions. With the rivers and streams flowing much faster through most sections it is important to find the seams of slack water along fast current. This is where the fish will be feeding as it takes less energy to stay in the slack current and the food will be flushed to them. With the fish being concentrated in the slower moving water during the run-off it is important to make sure those flies drift directly in their path. Be sure not to use too much split shot though because the last thing you'll want to do is to have to retrieve a snag in those cold waters. Remember that the hatches are becoming more frequent in the spring, so keep an eye for surface activity and do not hesitate to switch to a dry fly presentation, especially during the warmest parts of the day. We are approaching some of the best dry fly hatches of the year and anglers should be excited for the prospect of surface feeding. Mayfly and caddis patterns should be consistent fish producers this time of year. As of 6/21/2018 the trout fishing is fantastic with fish being caught in various areas of the lake, it seems most baits are working this time of year. Anglers are reporting many large fish being caught. Anglers are also reporting some success with Kokanee Salmon fishing deeper, pink has been a color mentioned as catching salmon lately. There have also been a few pike reported in the shallower sections of the reservoir the majority of the pike caught are small. This 2,967 acre reservoir is located approximately 32 miles east of Greeley and 10 miles north of Wiggins. As of 6/20/2018 lake level is full. Surface water temperature is approximately 64 degrees. Anglers have reported success catching wipers and walleye bouncing worms off the bottom. We are open to boating. Fishing has been fair to good for crappie, wiper and walleye. For up-to-date fishing conditions contact the park directly at 970-645-2551. June ANS Inspection Hours: Sunday-Saturday at ANS Station: 7am-9pm All boats must be properly registered and equipped in accordance with the State Law. All vessels are required to be inspected for Aquatic Nuisance Species (Zebra Mussels, et al.) prior to launching. Please help us protect our waters from these destructive creatures. Take time to read park and boating regulations posted at the boat ramp and help to promote safe boating. The ANS Inspection station is located at the main boat ramp. Outside of inspection hours, boats are required to have valid pre-inspection documentation (seal and receipt) prior to launch. Aquatic Nuisance Species Inspection hours for the month of May are 6:00 am-10:00 pm daily. As of 6/21/2018 water temperatures are in the mid to high 60's fishing has been good for trout using traditional baits all over the lake. Anglers are starting to report success with crappie fishing using live bait below a bobber. Bass fishing is getting better, jerk baits for Smallmouth and lipless crankbaits or spinnerbaits for Largemouth. Walleye have been caught throughout the lake mainly on live bait close to the bottom. Reminder - No fishing from marina slips or docks (next to is okay but can't use them in any way. PLEASE NOTE: Any live fish collected for use as bait may only be used in the same body of water from which they were collected. All live bait/fish from a commercial source and transported by anglers must at all times be accompanied by a receipt for the source. 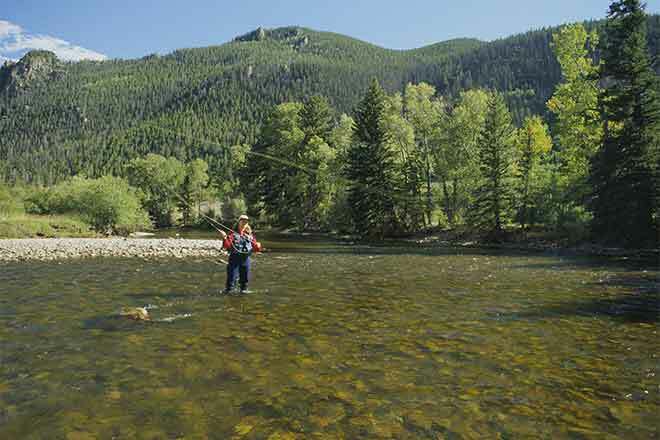 See the Colorado Fishing Regulations for further clarification and information. As of 6/14/2018, Water temperature is about 73 with some warmer temps in the shallow coves. Fishing is fair for Walleye, Crappie and Wiper, with slower bites being reported lake wide. Shore fishermen are reporting Catfish has improved. As of 6/22/2018, water temperatures are slowly rising and the fishing is continuing to pick up. Visibility has been reported around 7-10 feet with multiple hatchers occurring this past week. Anglers reported success catching trout in 8-16 feet of water using callabaetis nymphs in tan and green coloration. As of 6/21/2018 water clarity has improved over the past few days, and water level is beginning to drop. Walleye have been active throughout the lake. Bass have been biting in the early morning and evening hours, concentrated along the weed line. Trout season is winding down as the water temp warms up, so now is the time to head out! Please remember fishing is not allowed in the canals surrounding the lake. As of 6/17/2018 water levels are full and the temperature is nearing 70 degrees. Trout fishing is good from shore using PowerBait floating off the bottom. Fishing for saugeye and smallmouth bass is good from shore and from boat. Try swimbaits along the dam face for both smallmouth and saugeye. Reminder, this is a city of Lakewood Park, a state parks pass is not valid at this park. As of 6/17/2018 fishing along the southwest end of the reservoir has been good for bass. Fishing for walleye has been tough however when you find the fish they are willing to bite live bait on a jig or pulled behind a bottom bouncer. Trout fishing has been good throughout the lake on a variety of lures. There have also been reports of anglers having success casting to shore and landing largemouth bass. June 12th - Upper River: The upper Arkansas river is in excellent shape! Fishing along the edges has been extremely productive, and this is by far the easiest section of the Arkansas to wade fish at current flows. Below the confluence with Lake Creek, the river picks up 382 cfs from the reservoir outflow (clear water!) which helps to stabilize clarity through Granite. From now on, focus with stonefly and caddis patterns along the edges, where fish can find respite from the faster water. It won't be long until we see Drakes up at Hayden Meadows! Large attractor dry/dropper (Golden stoneflies, Yellow Sally stones, and caddis) set-ups, along with streamers should produce fish and make for a fun day. June 12th- Middle River: The middle basin is in excellent shape, as tributary flows drop and the release from Twin Lakes is cut back a bit. Conditions are very similar to what we find in early summer: fish holding in the slow, sheltered lies where they can ambush vulnerable food as it drifts by in the faster water. Much of this holding water is right up on the bank, or near it where both float fishermen and wade fishermen can easily reach it. Fish large attractors patterns along the banks wherever slower water can be found. With the growing presence of yellow sallies along the edges, sally dries or nymphs are an excellent option. We're seeing an increasing amount of surface interest, as more and more fish begin to eat chernobyl ants and stimulators. Dry/Dropper rigs with sallies or big attractor dries and caddis, sally, or attractor nymphs have been getting great reports. Streamers are also a good option as the brown trout fry emerge and are vulnerable as they acclimate to the changing river conditions. Advice to wade fishermen is to stay on the bank if possible, as the swift current can make for challenging wading. The fish are likely in the water you want to stand in! June 12th - Below Salida: The river is in excellent shape, and is really beginning to turn on. Summer hatches are beginning to show themselves, with a handful of golden stonefly sightings and lots of yellow sally activity below Salida (with reports all thed way up through Granite) the past week. Combining tributary flows receding and significant decreases in the release from Twin Lakes, flows are excellent and clarity is great on the river today. We've had consistently good reports the past couple of days from anglers fishing along the edges with attractor dry/droppers or shallow nymph rigs. Think summertime tactics, with fish taking up ambush lies near the banks waiting opportunistically for food to come their way. The pockets and edges along the shoreline provide a break from the current and holding water for the trout. Stonefly nymphs and caddis pupa fished under an attractor dry fly will move fish along the edges, and the presence of immature brown trout fry in the river make for excellent streamer fishing. As of 6/20/2018 things are heating up on the big desert reservoir. Surface temperature is around 55-60 degrees at various locations on the lake. Walleye are all the talk at this time of year. Anglers are having success using a variety of methods. Jerkbaits and crankbaits will yield success, as well as jigs. Bass are also starting to show their faces after their winter slumber. Some bass are being caught on jerkbaits and crankbaits as well as plastics. Flows on the tailwater below the dam have increased, as winter water storage has ended. The current flow is 382 cfs. Fishing has been good on the tailwater for trout. Even with the increase in release, flows are still relatively low, and the river is still manageable for wading. Anglers are reporting success on blue wing olive and midge patterns. Both boat ramps are open at this time. Summer hours are in effect; ramps open at 5 AM and close at 11 PM. This 762-acre impoundment is located off of E. Quincy Avenue, two miles east of E-470. As of 6/17/2018 water temp is 66 degrees. Trout fishing from shore has been slow to fair with a few good reports using power bait off the dam and open areas along the south shoreline. The trout are running deeper now, focus on fishing deeper areas like the dam casting out 40-50 yards with power bait off a slip rig! Boaters also reporting slow to fair conditions on trout. Boaters have reported anywhere from slow to fair reports on walleye using jigs, bottom bounces and jerk baits. No other reports on other species at this time. Restricted to electric motors only. For more information call 303-326-8425. Park hours June 5:00am-9:30pm. This 881-acre impoundment is located in Cherry Creek State Park, in Aurora. There are two entrances to the park, the east entrance off S. Dayton St. and the west entrance off S. Parker Rd. As of 6/22/2018 fishing for trout has been productive both from shore or boat using many different techniques. Walleye are being caught trolling bottom bouncers with crawler harnesses and jigs have been working too. The average size walleye is still around 16-17 inch range with some large specimen being taken occasionally. As of 6/20/2018 water temp is 66 degrees. Trout fishing from shore has been slow to fair with a few good reports using power bait off the dam and open areas along the south shoreline. The trout are running deeper now; focus on fishing deeper areas like the dam casting out 40-50 yards with power bait off a slip rig! Boaters also reporting slow to fair conditions on trout. Boaters have reported anywhere from slow to fair reports on walleye using jigs, bottom bounces and jerk baits. No other reports on other species at this time. Restricted to electric motors only. For more information call 303-326-8425. Park hours June 5:00am-9:30pm. This 1,356 impoundment is located in Chatfield State Park, as of 6/20/2018 water temperature is in the high 60's. Walleye fishing has been good, swimbaits and crankbaits have been reported to be catching fish. Anglers are also reporting walleye being caught using bottom bouncers and live bait. Pitching jigs with artificial tails in shallow water has also been catching fish. Smallmouth Bass have also been active along rocky shores in the lake with fish being caught on various presentations. Swim baits in the 3-4 inch range and scented plastics have been good producers for smallmouth bass. Please note that due to the Chatfield Reallocation construction fishing access from the west side of the park (Eagle Cove - Kingfisher) is closed. Please access the lake from the east side of the reservoir. As of 5/30/2018 Pike and trout are being caught throughout the lake. Bass fishing has been good near the Cedar Campground as well as near the dam. Special fishing regulations at Rifle Gap Reservoir include a bag and possession limit of 1 walleye 18 inches or greater; bag and possession limit for yellow perch is 20. As of 6/21/2018, Fishing is excellent with anglers reporting PowerBait the most successful bait. All three boat ramps are open at this time. The lake level is receding rapidly. Don't forget to stop at the entrance and have your boat inspected prior to launching. The ANS inspection station is open from 6:00 a.m. to 8:30 p.m. 7 days a week. Click for tournament information. As of 6/22/2018 fishing success at Elkhead continues to increase with anglers reporting catching bass and pike. Pike have been reported to be caught on almost anything that resembles a small bait fish. Keep in mind at the NORTH EAST ACCESS Pre inspection is required for all non-exempt hand launched vessels. You are required to have a seal and receipt to launch. Exempt vessels are: Kayaks, Canoes, Rafts, Belly Boats, Windsurfers (paddle boards), Sailboards, foldable plastic boats, float tubes and inner tubes. This 8,900 acre reservoir is located west of Gunnison. As of 6/22/2018, Water levels are much lower compared to last year and concentrating the fish. Kokanee Salmon fishing has been good 20 to 50 feet below the surface. The kokanee salmon fishing is expected to be fantastic once again throughout this summer. This time of year trolling is the ticket, figure out the depth and the color and you should be in for an exciting day of catching. Lake trout fishing is starting to slow down however; some anglers are reporting large fish being caught and released. Smaller lake trout are being caught in large numbers at the deeper depths of the water column. Trolling seems to be the most productive currently for Kokanee and the few trout being caught. Anglers can check on current conditions and boat ramp inspection schedules by contacting Curecanti National Recreation Area at (970-641-2337). As of 6/22/2018 Water temps are in the high 60's. We have had reports of perch, crappie, trout and catfish being caught recently. Perch have been very active over the past week with anglers reporting large amounts of bites using smaller presentations. The catfish can be caught on a variety of baits along the bottom. Shoreline CLOSURE 6/13/2018 Due to National Forest closure for wild fire protection Mancos State Park has closed portions of the facility, including the shoreline, with the exception of the rip-rap of the dam face and shoreline fishing areas on either side of the dam. Appropriately inspected craft may still be launched from the boat ramp; however, there is no other shoreline access from the craft. This closure is expected to last at minimum through 7/10/2018. The lake is open water and has been stocked with thousands of rainbow trout already this spring. Additional stockings will occur through the summer. Mancos is a great place for consistent action from trout and yellow perch. Most of the trout action is from 10-12 inch fish, but there's very good opportunity at an 18-20 inch trout and a few 12+ inch perch. There is great opportunity for kids to catch fish. Most anglers are finding success with bait (PowerBait, eggs, and crawlers) fishing just off bottom or under a slip bobber. For a chance at the yellow perch and trout, a small jig fished under a bobber on a long leader and tipped with a piece of worm is a good bet. Casting or trolling typical in-line spinners (Panther Martins, Mepps) from boats is another approach at the trout. Hand-launchable boats (non-motorized kayaks, canoes, belly boats, etc) are a great way to fish the lake in this off-season. This is the first year in more than 15 years that the lake has not gotten decent ice to fish. A park pass is required on vehicles in the park. Daily park passes are available at the self-serve pay station at the park entrance. As of 6/1/2018 Fishing at Navajo Lake is very good. The water temperature at the Two Rivers Marina is 63 degrees. Crappie fishing has been good with some 13-14 inch crappie being caught. Using jigs and fishing in water depths 6ft - 10ft. The smallmouth and largemouth bass fishing has been very good with some smallmouth up to 21 inches being caught, and several 7-8 pound largemouth. Pike fishing has been good fishing in the shallow water, using anything that looks like a bait fish. As of 6/12/2018 fishing has been good for pike with some large fish being caught both from shore and boats. The lake has recently been stocked with trout. Trout fishing has been good using green PowerBait eggs from shore. Expect the trout to be found in the shallow water of the lake. Another way trout have been caught recently is trolling Cowbells with a piece of nightcrawler behind. Lake trout are slowly transitioning into the deeper parts of the lake where they will stay for the majority of the summer becoming tough to catch.